The PM and her party has spent years opposing real protections for workers. Why should unions and Labour MPs trust her warm words? If Theresa May’s Brexit statement on Tuesday is to be taken at face value, the Tories are the absolute vanguard of workers’ rights in this UK. Her speech mentioned ‘workers’ eight times – including five mentions of ‘workers’ rights’. That is quite unusual for a Tory PM, to say the least. But of course, we are amid one of the biggest diplomatic games of our nation’s history. It is no secret that Theresa May has been meeting trade union leaders and Labour figures to get them onside. “A Labour government gave British workers annual leave and paid maternity leave entitlements well above that required by the European Union. “A Conservative-led government went further than the EU by giving all employees the right to request flexible working. And I was proud to be the Minister for Women and Equalities to introduce shared parental leave so that both parents are able to take on caring responsibilities for their child – something no EU regulation provides for. “When it comes to workers’ rights this Parliament has set a higher standard before and I believe will do so in the future,” the PM said. For decades, the Tories have opposed many of those policies – including voting against them in the European Parliament (not to mention opposing the minimum wage when it was introduced under Labour). Here’s nine reasons May’s promises on workers’ rights can’t be taken at face value. 1. In July 2017, the Supreme Court was forced to strike down an anti-worker Tory policy as unlawful and discriminatory. The Conservatives’ tribunal fees policy meant that thousands of workers had to pay fees of up to £1,200 to take their employers to court for unlawful dismissal and a host of workplace injustices. What followed was a collapse in applications from workers unable to afford the gamble of taking their bosses to court. The balance was fundamentally tipped in favour of corporations. 2. In 2016 – under Theresa May – the Tories’ Trade Union Act came into force. With it, a bizarre 50% turnout requirement (which, funnily enough, doesn’t apply to politicians). From March 2017, industrial ballots have to attract a 50% turnout in order for their results to be legally valid. As the Institute of Employment Rights point out, if 100 workers are eligible to vote, and only 49 turnout for the vote, workers cannot take industrial action…even if all 49 vote in favour. The government also refused requests for ballots to be made possible online – even though Tory members can vote online for their leader. The act came with a swathe of other restrictions on worker freedoms too. 3. Remember when the Tories cheered after blocking Labour’s attempt to scrap the pay cap for emergency service workers? Those Tory MPs were led by…you guessed it, Theresa May. Public sector workers have faced years of real-terms pay cuts under the Tories. 4. The PM has refused to scrap zero-hours contracts or take meaningful action to tackle insecure work, despite a protracted review into the issue. 5. Ministers extended the qualifying period for unfair dismissal protection from one to two years, to make it easier for employers to fire people. 6. The government have hampered employment tribunals, changing tribunal procedures so that employees lost the right to gather information from their employer about possible discrimination. They’ve also taken away the ability of employment tribunals to challenge discriminatory cultures in workplaces. 7. 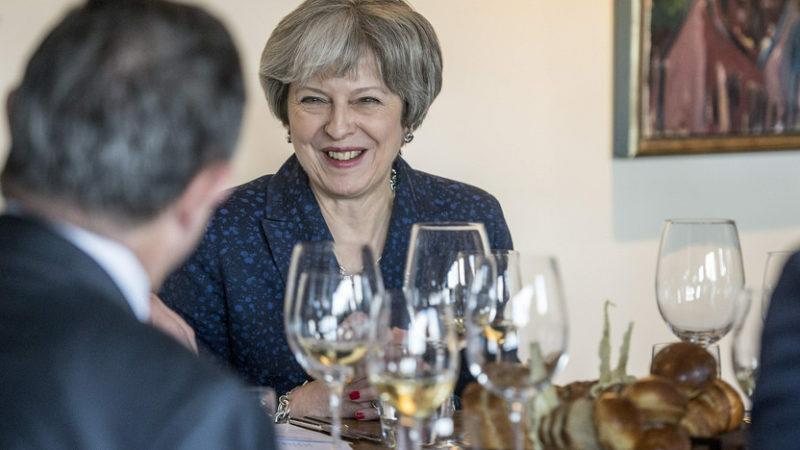 Theresa May has repeatedly delayed plans to stop restaurants stealing staff tips through extortionate fees. 8. The deal on the table fails to ensure the UK stays level with (or exceeds) future developments in EU workers’ rights after Brexit. 9. Many of the people who might succeed the PM (Boris Johnson, Michael Gove, Jacob Rees-Mogg, Sajid Javid) have shown explicit hostility to workers’ rights. There are zero guarantees that May’s successor would not rip up our hard-won rights. Even her own MPs have warned of this (see Ken Clarke’s speech). The PM also said: “The UK has a proud tradition of leading the way in workers’ rights whilst maintaining a flexible labour market that has helped deliver an employment rate almost 6 percentage points above the EU average”. In doing so, she cherry-picked the only statistic that could possibly make her look good. Even in praising workers’ rights – Mrs May trumpeted Britain’s awful working conditions. Quite the own goal. For all the warm words, the deal remains essentially the same – leaving workers’ rights in the lurch after Brexit. Josiah Mortimer is Editor of Left Foot Forward. Follow him on Twitter.